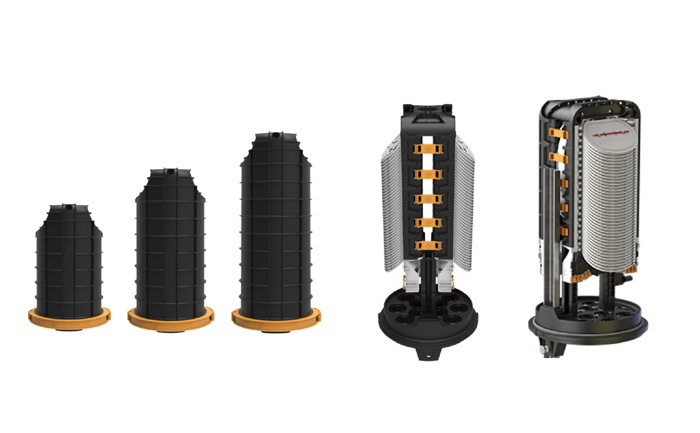 Large Multi-function Joints (LMJ) are for jointing of optical fibre cables up to 1344 fibres (with option to double capacity using 24 fibre single element trays). Our new range of joints is designed to integrate state of the art features into very cost effective products. They not only save you money, but are also designed to eliminate heat shrink thus no need for a heat source in the field during installation. Using Mechanical Seals to terminate the cables lowers OH&S risks and negates risk of fires. A large closure for optical cable splicing with two vertical tray stacks. Different cap lengths are available to configure the closure to the number of trays required. Maximum capacity is 1344 fibres using 12 fibre single element trays. Capacity can be doubled to 2688 fibres using 24 fibre single element trays. Contains a mechanical oval port and central loop storage. Two input manifolds manage cable tubes to a common routing channel. Input manifolds enable fibres to be passed from stack to stack. One mechanical oval port cable entry for cables up to 18 mm. Ten circular port cable entries. Cables are sealed using mechanical sealing glands. Cables from 4 to 23 mm in diameter can be accommodated into each circular port. Multi Way Entry Glands provide alternate mechanical entry to allow up to 8 cables in each circular port. Can accommodate a range of splitter modules from 1×2 to 2×64. Currently available in three sizes: Short (containing 48 splice trays), Medium (containing 80 splice trays) and Long (containing 112 splice trays), with kits available to upgrade the joint between the different capacities. Outside plant optical fibre enclosures for underground and aerial applications. Up to 2688 splices, suitable for optical cable connection, branching and mid-span.